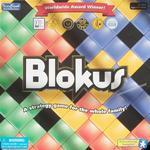 Description: Blokus is an abstract strategy game with transparent, Tetris-shaped, colored pieces that players are trying to play onto the board. The only caveat to placing a piece is that it may not lie adjacent to your other pieces, but instead must be placed touching at least one corner of your pieces already on the board. There are unauthorized versions of the game published under various names, including The Strategy Game, Tetris, and The Family Chess Game.